Although "The Chronicles of Narnia" developed from the fancies of C. S. Lewis, curiously some parts find their roots in Italy and Italian culture. Lewis knew the history of Italian culture quite deeply. His position as a Fellow at Oxford and later as a Professor at Cambridge gave him the opportunity to study classical literature and Latin poets such as Livy, Tacitus, Pliny the Younger and Pliny the Elder. When Lewis, or Jack as he was called as a child, was young his teacher, Kirkpatrick read many classic with him and later said that, "Lewis read more classic books than any other boy that I taught." Lewis became very proficient in Latin, carrying on a correspondence in that language with don Calabria, an Italian priest from 1947 until 1954. These letters were eventually translated by Luciano Squizzato and entitled "Una Gioia Insolita.?" From between the ages of 12 to about 22, Lewis read many classic Latin writers. According to Paul Ford's Companion to Narnia, Lewis's first successes at Oxford were in the classics and ancient history, it is quite possible that he came across at least seven references to Narnia in Latin literature. "Four references are found in Livy's History (10:10, 27:9,27:50, and 29:15)... ... Tacitus's Annals (3:9).... Pliny the Elder's comment in Natural History about its unusual weather (it became drier in the rainy season).... Pliny the Younger's letter to his mother-in-law, in which he mentions the excellence of the accommodations of her villa at Narnia, especially its beautiful baths. Of all of these references, Lewis mentions only Pliny the Younger, in a letter to Arthur Greeves (They Stand Together, Macmillan, Collins, 1979, p. 171)." The name, Narnia, that Lewis bestowed upon his land of talking beasts, speaking streams and Aslan the lion was most likely taken from his readings of classical writers who introduced the town of Narnia to him as the last defense of Roma on the Flaminia road. 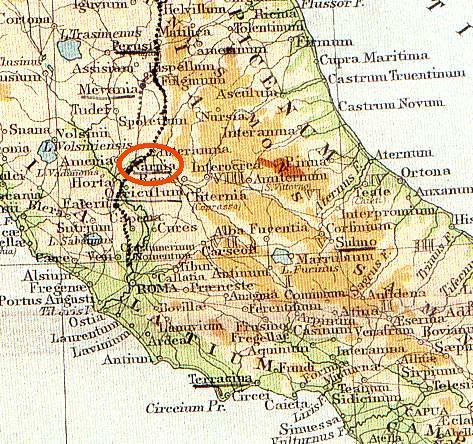 This idea was lent even more credence when one of Lewis's biographers, Walter Hooper, discussed a map of Italy from "Murrey's Small Classical Atlas" that had once belonged to Lewis. On the map Lewis had underlined several towns; one of them is Narnia. 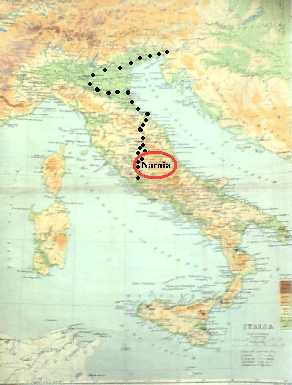 Narnia is now named NARNI and is very close to Rome.